What charitiy do you support – and how? I don’t support one charity per se, I support individuals. It takes a very strong person to tattoo your political convictions on your body – that’s not a ‘pretty’ tattoo – and its not just printing something on paper or on a t-shirt. Anyone that comes to my studio and wants a ‘Free Tibet’ tattoo – these I do for free. That person is carrying a strong message around the world. I was born in Amdo in Tibet. The Chinese were already in control of my country when I was born so I witnessed the injustices first hand. 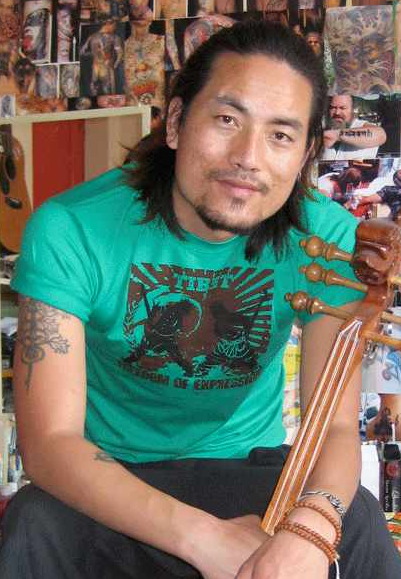 I came to India eight years ago – I wanted to see HHDL, study art, English, and play music. It is common for young Tibetans in Tibet to not understand the political situation – we just know that China invaded Tibet. It took me 43 days to get from Lhasa to Nepal, which is where the Tibetan Reception Center is. Refugees have to cross the Himalayans by foot. When I arrived at the reception center in Nepal, I saw a flag, with two lions. It was 2 days before I knew that it was the Tibetan flag, I had no idea Tibet had a flag – it is illegal to have, or fly the Tibetan flag in Tibet, you can go to jail for that.